Facing the decision to move your mom or dad into an assisted living community can be difficult for any family. Siblings may disagree about the type of care that your parent needs. Your parent may not want to move from their family home. And you may feel guilty or insecure about your decision. Some Asian American families often feel even more conflicted when the very concept of moving a parent into a retirement or assisted living community clashes with their cultural expectations. Due to this specific dilemma facing many Asian families, Aegis Living created a community specifically designed for seniors celebrating Chinese culture in Fremont, California. 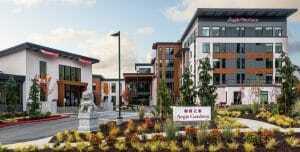 With the great success of the California community and the changing attitude of immigrant families regarding assisted living, Aegis Living opened a second Chinese culture community in Newcastle, Washington. Aegis Gardens brings together residents and families with an emphasis on Chinese culture, traditions, and food. When residents are able to easily relate to their neighbors’ background and upbringing, they find an instant sense of community, belonging, and commonality within this type of community. Aegis Gardens‘ Life Enrichment staff schedules activities that are familiar such as mah jong, calligraphy, and tai chi classes (or “chair tai chi” for those with limited mobility). Surrounded by feng shui design and traditional décor, like a Zen garden, residents feel at home in a comfortable environment. Chefs prepare Chinese cuisine in the Peking duck oven and within the fine dining restaurant that reminds them of childhood meals. The tea rooms soothe with authentic blends reminiscent of home. These unique details and customized amenities provide residents and their families, from all backgrounds, with a community that feels familiar. It is essential to understand the needs of senior residents and they are able to clearly communicate with the assisted living care staff. Residents are cared for by multilingual staff. For residents with dementia, the memory care wing, Life’s Neighborhood, provides the care your loved one needs in an intimate setting with specifically-trained dementia care staff. Change can be difficult for anyone, but particularly hard for seniors who are moving into an assisted living community. They may feel nervous about making new friends and finding where they fit. Creating a home that is comfortable and familiar is key to making them feel at home. For Asian American seniors, a home where they speak their native language, honor their traditions, offer familiar cuisine, and provide exceptional care will allow your parent to adjust quickly and feel a part of their community. Contact an Aegis Gardens marketing director to learn more about this unique community and schedule your tour.